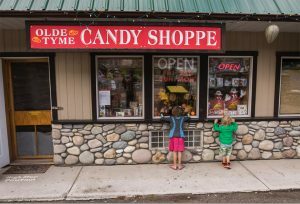 The Olde Tyme Candy Shoppe located in the the Village of Radium Hot Springs in the heart of the Columbia Valley! The Olde Tyme Candy Shoppe has been in business since 1997. They pride themselves on providing customers with the largest variety and selection of sweets available, as well as exceptional personal service! You can find the Olde Tyme Candy Shoppe on Main Street West and enjoy a trip down memory lane as you will find many of your favourite candies from your past. Their promise to you is to satisfy your sweet tooth!